COLORADO SPRINGS, Colo. — USA Triathlon today announced the results of its 2018 Board of Directors and Athletes’ Advisory Council election. Ben Collins (Seattle, Wash.) was re-elected as an Elite Athlete Representative on the Board, while Greg Billington (Spokane, Wash.) was elected to the Athletes’ Advisory Council. An election for a second Elite Athlete Representative on the Board resulted in a tie. A run-off election will take place among eligible elite athlete voters to elect either the incumbent, Joel Rosinbum (Austin, Texas), or Renée Tomlin (Ocean City, N.J.). The runoff election will take place beginning tomorrow, Nov. 1, when ballots are distributed and will extend through Nov. 30. The result will be announced in December. Erin Storie (Colorado Springs, Colo.) currently holds the third Elite Athlete Representative seat, having been elected in 2017. All elite athlete candidates are elected by their peers, with voting open to any individual holding a USA Triathlon elite license. The Elite Athlete Representatives on the Board of Directors provide insight, perspective and advice from the elite athlete community. Elite Athlete Representatives are full-fledged Board members, participating in all Board meetings and voting on all decisions. Collins was first elected to the USA Triathlon Board of Directors as the Elite Athlete Representative in 2015. An elite triathlete since 2008, he logged nearly a dozen top-10 finishes on the ITU circuit before switching his focus to non-drafting events. Collins is now a three-time winner of the New York City Triathlon and a two-time IRONMAN 70.3 champion. He also serves as a sighted guide for nine-time ITU paratriathlon world champion Aaron Scheidies (Seattle, Wash.) in elite international competition. The Athletes’ Advisory Council (AAC) is a USA Triathlon bylaw-mandated standing committee that broadens communication between USA Triathlon and elite athletes, and serves as a source of opinion and advice to the USA Triathlon Board of Directors. The AAC makes recommendations to the Board on issues related to the needs and concerns of USA Triathlon’s elite athlete members, including, but not limited to: race selection, USA Triathlon National Team qualification criteria, elite athlete rankings, competitive rules in elite races and the procedure for the appointment or election of elite athletes to the U.S. Olympic Committee’s Athletes’ Advisory Council. Billington was a member of the U.S. Olympic Triathlon Team at the 2016 Olympic Games in Rio de Janeiro, Brazil. During his career on the ITU draft-legal circuit, he collected six ITU Triathlon Pan American Cup medals and an ITU Triathlon World Cup medal, recorded a fourth-place finish at the 2011 ITU Under-23 World Championships, and earned two top-10 finishes in ITU World Triathlon Series races. Billington announced his retirement from elite triathlon competition in 2017. 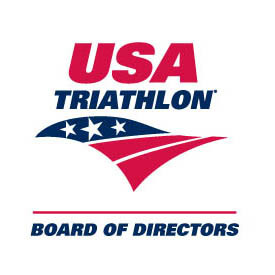 As mandated by the USA Triathlon bylaws, officer seats— including President, Vice President, Secretary and Treasurer — will be elected by members of the Board at the first meeting of 2019 in January. More information on the 2018 USA Triathlon Elections, including candidate platforms, can be found at usatriathlon.org/governance. To view the complete Board of Directors listing, click here.